My friend, Karen, has been tweeting out “Make Bank” opportunities all month for Connected Educator Month. What’s the Make Bank? It’s a legacy resource created by the Making Learning Connected MOOC over the past two summers, with rich ideas around making, learning, creating and writing. The Make Bank never closes down, but as Karen wrote in her post for Digital Is, sometimes, it helps to be reminded. 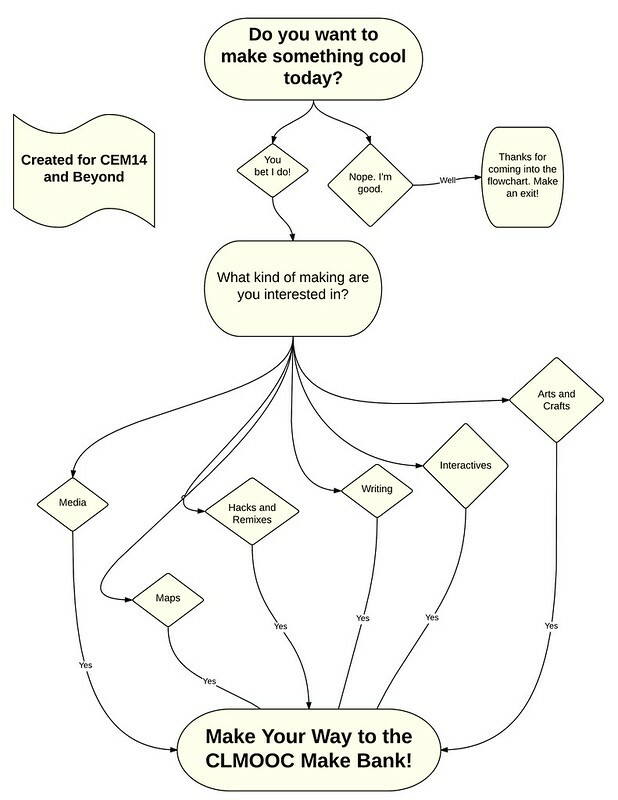 I decided to whip up a short flowchart about using the Make Bank. I might make it more interactive, using ThingLink, in the next iteration. I “made” the flowchart with an app called Lucidchart, which I think is free for the basics. I like making flowcharts but I realize that I am still learning the lexicon of symbols. That’s another post for another day.